Pope John Paul II has beatified and canonized more individuals than all his predecessors put together. Since these solemnities occur with such frequency, they receive at most perfunctory mention in the American press. The beatifications taking place in Rome on Sept. 3, however, have excited notice because, though they include Pope John XXIII, they also include Pius IX, who reigned from 1844 to 1878. Some Jewish organizations, Catholic columnists and others have made their shock, even indignation, known because of the so-called Mortara incident during Pius’s pontificate, almost forgotten until David L. Kertzer published The Kidnapping of Edgardo Mortara three years ago. In Bologna, after nightfall on June 23, 1858, the papal police arrived unannounced at the Mortara home and removed from this Jewish family one of their sons, Edgardo, six years old, because he had been secretly baptized by a Christian maid when he was dangerously sick as an infant. Despite the anguished pleas of Edgardo’s parents and international indignation, the boy was never returned to his family. He became almost a personal ward of Pius IX and eventually was ordained a priest. But there are misgivings in other quarters and on other scores. On July 8 The Tablet, the well regarded English Catholic weekly, carried an editorial, A Beatification Too Far, that was uncommonly sharp in its criticism of the Holy See. It can only be seen as a political move, designed to provide a conservative and reactionary counterweight to the beatification of John XXIII.... The conclusion is surely inescapable that the beatification of Pius IX is the work of a small group of ultra-conservatives. In Italy, I am informed, the political left is howling with feigned indignation, which masks its genuine glee that the Catholic Church has through this action once again manifested its true, fascist character. The focus on Pius has thrown into the shadows Pope John XXIII (and three others) who will be beatified in the same ceremony. Nonetheless, almost as if in anticipation of The Tablet’s inference, Msgr. Brunero Gherardini, postulator of Pius IX’s cause, has publicly denied that the beatification together of the two popes is a political juggling act. They were both great saints, although very different human beings. The beatification of Pius IX is an act of justice delayed for too many decades by objections from circles outside the church. The controversy, such as it is, will soon die down and the event will be forgotten. Not many Catholics care one way or the other, for they have never heard of Pio Nono. Even in the Marches, the region of Italy from which he came, he is today scarcely remembered and has there today no cult among the faithfulwhich does raise the question of where the recent impetus for the beatification came from. Although Pius IX may become an icon for militant traditionalists, for the devotional life of the faithful he will almost certainly continue, even if later canonized, in his present state of oblivion. It is important to provide background for understanding how we got to the present point, and to examine an issue that goes beyond the event itself. That issue is the problems and ambiguities inherent in trying to define sanctity nowadays and in holding up models of it, especially when the persons are great public figures from times and cultures so different from today. The points discussed will come as no surprise, but they might take on new sharpness when examined with this case in mind, awash as it is in ironies and extremes of various kinds. But first, the background. The ceremony for Pius on Sept. 3 will be a step on a long and bumpy road that began almost a century ago, when in 1907 the first formal steps were taken in the Roman vicariate. Kenneth Woodward tells the story up to 1990 in great detail in Making Saints (1990). Support for the cause waned with the passing of the years. A new phase opened in 1954, and in the early 1960’s it entered what seemed to be its final phase before papal approbation. But it languished again. Revived early during the present pontificate, it met a setback when John Paul II, after receiving a long report, seemed persuaded by the arguments of those who opposed it. Then last year the pope asked the Italian episcopal conference if it should go forward, and he received in reply an almost unanimous affirmative. Still, the announcement that the beatification would actually take place caught even many Vatican-watchers by surprise. Causes for beatification and canonization often take a long time, but why has this one dragged on? Not for lack of information. In fact, the overwhelming amount of testimony of various kinds has been as much a hindrance as a help. Pius had the longest pontificate in the history of the church. His definition of the Immaculate Conception, issuance of the Syllabus of Errors and convocation of Vatican Council I make him an extraordinarily important pope and generated even during his lifetime an immense amount of documentation directly or indirectly concerning him. As monarch of the Papal States, his many dealings with leaders of other nations placed him in a major role in the history of the West in the 19th century. In Italian history he broods over the century as the most prestigious and most adamant obstacle to the unification of the country that finally took place in 1870 with the seizure of Rome. The amount and diversity of the information concerning him can seem limitless. The problem has been how to assess this material and move beyond both the vituperation and the adulation in which it has generally been encased. Every historian who has written about him, and the number is legion, divides his life (and pontificate) into two parts: everything up to 1848, when he fled Rome because he believed he was about to be dethroned by revolutionaries, and everything afterwards. The conclave that elected him in 1846 chose him over Cardinal Lambruschini because he gave promise of reversing the reactionary and rigidly repressive policies of Gregory XVI. For the first two years, Pius seemed to respond to those hopes. He had the gates of the Jewish ghetto in Rome dismantled. An ardent patriot, he threatened Metternich of Austria with excommunication when Austrian troops occupied Ferrara. He allowed broader consultation in the administration of Rome. Measures like these assumed a tremendous symbolic meaning that gave birth to the myth of a liberal pope. In 1848 revolutions against the political restorations of 1815 following Napoleon’s defeat spread across the continent. The restorations had put most of the old monarchs back on their thrones. In Italy the patriots seized the occasion and tried to enlist Pius in their cause, but they envisaged a united Italy in which the pope, though he would have independence as head of the church, would no longer be the ruler of Rome and the Papal States. The political situation was tense and came to a head in the brutal political assassination of Pius’s prime minister, Pellegrino Rossi, on the steps of the papal chancery. The pope took fright and under cover headed to Gaeta, south of Rome. When he was finally able, with the help of French troops, to return to Rome two years later, he seemed a changed man. He shed any vestiges of sympathy for the policies of the liberals and set his face against anything modern. Thus was born the familiar image of Pius as the very quintessence of ecclesiastical obscurantism and intransigence. A few members of the Catholic clergy and laity agreed with this image, but most saw him as a hero, especially after the occupation of Rome in 1870 by the troops of King Victor Emmanuel and the pope’s retirement to the Vatican sector of the city as a self-declared prisoner. Sympathy for him, propelled by the Catholic press, surged, along with indignation that the church had been robbed of its sacred, earthly kingdom. Some Catholics argued both before and after the event that the pope and the church would be better off without this temporal monarchy, but Pius condemned the idea as impious. The pope’s distress as the prisoner of the Vatican generated an important and hitherto unheard of virtueloyalty to the pope. This was not religious faith in doctrines like papal primacy or infallibility but allegiance to an individual and his policies. Thanks to the new means of communication and the drama that so often marked Pius’s long pontificate, Catholics knew the pope’s name and recognized his portrait. Pius was the first papal mega-star. He was helped in this regard by some nasty enemies, against whom he stood firm. The Catholic clergy and laity in Germany found in him a bulwark against Bismark’s arrogant attack on the church in the Kulturkampf. In Italy itself, the leading liberals were bitterly anti-clerical and as out of touch with the religious sentiments of most Italians as Pius was out of touch with political and other realities. The closing of Catholic schools, the exiling of some bishops and similar moves taken especially before 1870 led many Catholics, even when they felt torn by Pius’s policies, to see him a protector of values they deeply treasured. In many parts of the world, moreover, Catholics were a minority oppressed or belittled by progressive regimes, so they could identify emotionally with a pope who seemed to be suffering in a similar way. Pius promoted devotion to the Sacred Heart and of course to Mary in her Immaculate Conception. Although Jansenism as an organized movement had by then spent its force, it had left an impact on Catholic life almost everywhere. Through these devotions, through declaring Francis de Sales a doctor of the church and through other means, Pius helped turn piety in a more heartfelt direction. After his death Catholics began calling for his canonization. Then he rather quickly slipped from their minds. For decades practically every assessment of him was tendentious, one way or the other. In 1952 came the first sign of change. Canon Roger Aubert, then professor in the seminary at Malines, Belgium, published in French a book on his pontificate that employed a more dispassionate and methodologically sound approach, which he followed in 1962 with one on the First Vatican Council. But then came the three-volume biography, Pio Nono (1974, 1986, 1990) by Giacomo Martina, a Jesuit professor of ecclesiastical history at the Gregorian University. The work of a lifetime of research and reflection, Martina’s Pio Nono is a masterly accomplishment, a balanced critical and painstakingly thorough account. None of these works has been translated into English. With that background we can move to the second point: this beatification raises in a particularly sharp way intriguing questions about sanctity and models of sanctity, questions that would not have been so acute for earlier generations. There are a number of them, all interrelated, so that dealing with one invariably entails dealing with others. We are today psychologically savvyor at least we like to think we are. How do we relate sanctity to emotional health? We have a sharper historical consciousness. How do we assess sanctity when manifested in an age whose values and religious sensibilities seem so different from our own? Underlying that question is the question of historicism: is each age to be judged by its own standards? That is a question about relativity. If each age is so to be judged, how does the relationship between sanctity and orthopraxis/orthodoxy work when standards have shifted with time? The question is acute for Pius, since he left no spiritual writings of note by which we might more directly enter his inner life. We are suspicious of authority and hold it to high standards. What is the relationship between personal piety and the public actions of persons with grave responsibilities toward others? That question is especially crucial in this case. On Sept. 3 it is not simply Giovanni Maria Mastai-Ferretti, a model Christian man, who is being beatified, but also Pius IX, model pope. It is also Pius IX, model monarch, who had troops and police at his service. At issue of course are models of holinessfor whom, to what degree and with what qualifications is this blessed or saint a model? Let us pursue those questions with our case. Especially in his early years Pius, scion of an aristocratic family, impressed everybody with his graceful manners but even more with a serenity of spirit that seemed to radiate from him. The soul of an angel was the reluctant compliment wrung from a liberal Italian politician. Pius, genuinely devoted to the poor, was anything but an ecclesiastical climber, and, unlike Cardinal Antonelli, his long-term secretary of state, he was incapable of duplicity. What you saw was what you got. There is reason to think him holy. In April of this year, when his body was exhumed from the crypt of the Basilica of St. Laurence, the prelates found it almost perfectly preserved. But saints, with perhaps a few exceptions, have their warts. As the years wore on, Pius’s mood swings in public and private became more noticeable and more frequent. In public and private he burst into scoldings of persons present or absent. Intransigent, the adjective so often applied to him by historians who know little about him, is echoed time and again by Martina, the biographer who knows him best. Pius wrote in 1877, the year before his death, I exclude the possibility of any relation, even indirect, with men who have despoiled the church. As Vicar of a crucified God, he would gladly suffer, but never compromise. Yet he was easily swayed. When in September 1870 the Italian troops had surrounded Rome and were ready to attack, Pius gave orders to his generals that they were to yield at the first gunfire. No blood was to be shed. On the day before the attack, however, the generals pleaded with him that their military honor required that they resist. Pius acquiesced, laying down the condition that firing cease as soon as the enemy made a breach in the defenses. Before the breach was made some 50 soldiers lost their lives. The enemies who on that day seized Rome from him did not, for reasons of their own, treat him badlyat least not nearly so badly as they could have. By the Law of Guarantees of 1871 they provided for him almost the same settlement as did the Lateran agreements of 1929 that established Vatican City. Pius had good reason not to trust them, but he also closed his ears to moderating counsel. His Non expedit forbidding Catholic participation in the politics of the new nation, though of mitigated enforcement, caused anguish and confusion for a half century. He was a person of modest intelligence. Odo Russell, the British ambassador to the Holy See, fond of Pius, spoke of his amiable but weak mind. Pius’s education, innocent of intellectual challenge, was rudimentary in theology and history, which helps account for measures like forbidding women to be members of church choirs because, he affirmed, St. Paul forbade it. Even Monsignor Gherardini admits that from a political point of view, he was not a genius. Yet we have all known truly holy persons whose education and intelligence were quite modest. Sanctity is an affair of the heart, not the head. The special problem that the beatification of a person with public responsibilities raises is how they try to compensate for such limitations so as to act as judiciously as possible. That means most obviously choosing good advisers. This suggests a strange circle: perspicacity is required to identify the advisers, and yet the advisers are meant to supply for lack of perspicacity. This perspicacityor, better, wisdomdoes not seem, however, unrelated to virtues like humility, the willingness to admit to correction. Pius surrounded himself with mediocrities, adept principally at telling him what he wanted to hear, a fact commented upon by many contemporaries otherwise favorably disposed toward him. As one of his personal chamberlains he chose Monsignor George Talbot, a converted Anglican priest, in whose judgments he placed almost unqualified faith. Talbot, emotionally unstable, fanned Pius’s already deep suspicions of Newman and in general offered him the most reactionary advice imaginable. In 1868 he had to be removed from the Roman curia to a mental institution outside Paris, where he died in 1886. This raises the issue of Pius’s prudence in governing the church, a concern that comes up many times in the official documentation for his cause. This is an aspect of the relationship between sanctity and the public acts of a leader. How prudent, for instance, was Pius during Vatican Council I? Martina maintains that the fundamental freedom of the council was not compromised. But he points out the intrusiveness of Pius’s interventions and the emotional pressures he directly and indirectly applied to the bishops, as when he threatened, If they won’t define it, I will do it myself. Cardinal Guidi, an ardent infallibilist, proposed to the council that it was the papal magisterium, not the person of the pope, that was infallible and that this magisterium was infallible only when exercised in accord with the episcopacy. Pius, angry, dressed him down that evening with the famous words, I am the church! I am the tradition! Like most ultramontanists, Pius saw infallibility as the only bulwark against the moral, doctrinal, social and political chaos threatening the church and civilization in his times. Liberty, equality and fraternity summed up the threat. That battle cry of the French Revolution reverberated through Europe in the 19th century. For Pius it signified the overturning of the order God had established. It had in fact provided warrant for great atrocities against priests, nuns and othersThe Dialogue of the Carmelites. Pius saw it expressing the very core of the evils of modern times. For centuries the phrase modern times meant little more than recent times, but particularly in the 19th century it assumed an ideology. Modern implied a historical process in which later times were better than former. Modernity meant progress. Progress meant the inevitable march of history away from the superstitions of Christianity or, certainly, of Catholicism. No wonder Pius rejected the construct. He substituted for it its antithesis: modern times were the worst of times, with worse still to come. His vision, apocalyptic, put the papacy at the head of the good in the cataclysmic struggle. This profound pessimism and sense of siege begot the Syllabus of Errors of 1864. Many of the 80 points scored by the syllabus were traditional, but the scathing sweep of the document took people’s breath away. Nothing, it seems, was right in the world. The church alone held the truth. The last six points condemned freedom of speech, religious tolerance, the disestablishment of Catholicism as the state religion; it condemned the idea that abrogation of the civil empire of the church would allow it to function more freely and the idea that the pope could and should be reconciled with modern society. The church has in the meantime been reconciled with modern society in ways and to a degree Pius IX would find utterly incomprehensible and intolerablewhich brings us explicitly to the historicist aspect of our issue. Do we judge Pius’s conduct against the standards of his day or ours? The forcible taking of the Mortara boy from his parents, who had no legal recourse against the actions of an autocratic state, would be judged by most Catholic theologians today, I believe, as wrong, a violation of a fundamental human right. Yet nothing is clearer than that Pius, basing himself, he said, on the principle that the spiritual takes precedence over the temporal, acted in accord with his conscience. He felt the criticism his action provoked, but he had no choice. In a letter to young Edgardo, he told him how much he had suffered on his account. The governments of Britain and France, for instance, had protested and done their best to shake the pope’s determination. But the Catholic press and prelates worldwide unflinchingly defended the action as good and right. Like his papal predecessors, Pius believed in capital punishment. On June 12, 1855, for instance, Cardinal Antonelli saw a disreputable looking man near him reach into his shirt. Antonelli fled and shouted for the police. The police caught the man, Antonio De Felici, who by then was indeed brandishing a weapon, a large carving fork. De Felici, known as a political subversive, was promptly tried by authorities of the papal government, convicted and sentenced to death by decapitation. It seems, moreover, that Antonelli intervened with the pope to have the sentence commuted to life imprisonment, but to no avail. Pius fiercely opposed religious toleration. He contested the extremely modest concessions for worship the Spanish government extended to Protestants and was shocked that the Grand Duke of Tuscany, yielding to pressure, allowed Jews to attend the university. In all this he was not only following his conscience but following standard Catholic teaching. Of course his words and actions helped form that teaching. There is no need to insist how far they depart from Catholic teaching and a more general moral consensus in place today. To put it crudely, the beatification dramatizes the cultural conditioning, within limits, of what is considered virtue. It dramatizes the historical character of the canon for orthodoxy in moral matters. I have in these few pages tried to expose an issue that the beatification of Pius IX raises. It raises them in a more pointed way than the simultaneous beatification of John XXIII. Although only a century separates these two popes, the former seems almost incomparably further removed from modern sensibilities. Beatifications deal with the past but are actions done in the present and for the present. Pius will on Sept. 3 officially become a model of sanctity. For whom is this model meaningful, for whom intended? Popes? Political leaders? Ordinary faithful? No matter what the answer to such questions, the model provided by every saint and blessed must be translated if it is to be meaningful in our lives, but for Pius the translating will be especially tricky and taxing. What kinds of persons, I wonder, will make the effort for themselves? And with what result? John W. O’Malley, S.J., is too gentle with Pius IX (8/26). The pope “acted in accord with his conscience.” The ultimate justification used by an extremist or fanatic. Pius IX undermined the church’s intellectual credibility with his Syllabus of Errors. By his fierce espousal of a union of church and state, he seriously affronted American views on democratic government and furnished a specific reference for anti-Catholic feeling. Cartoons by Thomas Nast featured grotesque images of Pius IX and of crocodiles, jaws shaped like bishops’ miters, crawling up to the nation’s capitol flying the papal flag. Both scholarly and demagogic sources quoting Pius IX helped to deny full entry of Catholics into American political life. It took several generations of subsequent popes and thoughtful Catholic theologians like John Courtney Murray, S.J., the experience of Catholics and non-Catholics serving together in World War II and, in the opinion of some commentators, the coming to the papacy in 1958 of the genial John XXIII to dispel the shadow of Pius IX and in 1960 to see John F. Kennedy elected as the first Catholic president. In reference to the article by John W. O’Malley, S.J. on the beatification of Pope Pius IX (8/26), I am moved to ask, Was it not this pope whose body the Roman citizens attempted to throw into the Tiber during his funeral procession? I think the real question Catholics worldwide deserve to have answered concerns what meaning this beatification is intended to have. Are we supposed to pray to him for guidance? Are we to meditate on his life—as man or pontiff—as it reflected the teachings of Jesus? Or are we expected to acquiesce in the glorification of a man who was obsessed with maintaining the temporal power of the Catholic Church at any price? Many of us who know Plus IX from a historian’s perspective see him not as a model of sanctity but as a major player on the stage of 19th century European politics, and not much more. His convocation of Vatican I, his doctrinal issuances, his bellowing: all ring of politics, power and reactionary impulses, not of grace and God’s work in the world. Father O’Malley’s citations of “graceful manners” and “serenity of spirit” serve only to underscore the lack of substantial Christian content in his historical legacy. It is true, as Father O’Malley notes, that “all saints have their warts,” but where is the sanctity here—other than in his “almost perfectly preserved body”? The Mortara incident is just one episode in his reign, and, while it may seem crucial in our modem context, it does not necessarily portray the man as a whole. But what about him justifies beatification? As far as I can tell, it is merely his exaltation of the church’s power, which, for me and many others, is just not enough. The present pope ought to invest his efforts in finding saints whose lives imitate Christ’s and leave the politicians to rest in peace unbeatified. The article by John W. O’Malley, S.J., on (8/26) was most interesting. I’ve had the issue on my desk since it arrived, and I’ve been looking at the pope’s picture. He’s starting to grow on me. There are only a few degrees of separation between us: 1) I knew several nuns in the community I belonged to for five years who 2) knew and lived for many years with their founding sisters, who 3) had met Peter Richard Kenrick, Archbishop of St. Louis, who 4) voted non placet on the issue of Pope Pius IX’s infallibility. So, even though I’m not in favor of this strange man’s beatification, I’m giving him the benefit of the doubt. I’m asking him for a little miracle. I’ll let you know if it happens. 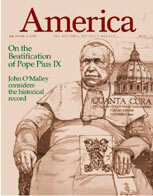 It was very disheartening to read the article by John W. O’Malley, S.J., on Pius IX (8/26). Why have saints at all, if there is so much politics and deceit involved in the process of becoming a saint? Shouldn’t a saint be a role model and provide encouragement for how one might live one’s life? The process seems to have been degraded to a reward for fame and notoriety or a contest among religious orders to see who can have the most saints. Why should any individual or any group lobby or push for years to “get someone canonized”? It is only that the people in the church are inspired by the life of a person that should be the reason for having saints. Any other reason should be suspect. What are saints for? Certainly any new ones should be models for Christians living in this 21st century. John W. O’Malley, S.J., in his article on the beatification of Pius IX (8/26) raises the issue of whether this beatification is an empty effort on the part of the Vatican to counterbalance the elevation of John XXIII. In other words, is it another example of “spin”? It is at least that, and perhaps it is another addition to the “structures of deceit” of which Garry Wills has written. It gets to be embarrassing to be a Catholic Christian who has to read in Time that the beatified Pius IX was one who called Jews “dogs.” Though Father O’Malley cautions us not to judge past historical actions by present-day standards, aren’t we talking here about some basic human attitudes, supposedly built into the life of a graced Christian who is striving to live a Christ-like life? Then again there seems to be ample evidence that Pius IX was not a very stable personality, and that is why it took all this time for him to emerge as a good candidate for beatification. Just in time to make it on the very day as John XXIII; Vatican II policies balanced nicely by Vatican I ones. What are saints for? Certainly they are not meant to be pawns in games played out to score ecclesiastical points. Saint-making needs an overhaul, and it needs a great deal more discernment than it is presently getting. Regarding the recent publicity given to the beatification of John XXIII and Pius IX (8/26), it is important to remember that the authentic basis of devotion to the saints lies in local popular cult. This existed long before the process was taken over by papal authority and the Roman Curia and still serves as the necessary foundation. At present we have a pope who freely dispenses from the rules of the process and appears to be impatient with the normal and slow development of cult. As a trained liturgist, I have assisted several religious communities in the revision of their liturgical calendars. The complaints (from communities of both men and women) are largely the same: too many feasts of Apostles, too many popes and bishops, too many men and not enough women. They desire to trim the calendar down better to approximate actual and potential devotion. Most interesting is the common insertion of men and women not officially recognized: Dorothy Day, Thomas Merton, Oscar Romero, Martin Luther King Jr., women mystics and others. This is real cult at work, going back to our origins. It bears watching and has much to commend it. It is good to remember the principle of the “Constitution on the Sacred Liturgy” (No. 111): “Only those [saints] should be extended to the universal church which commemorate saints who are of universal importance.” In the actual reform of the Roman calendar, it was politically impossible to carry this out, and we ended up with a padded calendar. Local communities have been completing this calendar reform and enriching it with new popular cult. The article by John W. O’Malley, S.J., (8/26) exploring the beatification of Pius IX was informative and, to be sure, helped to provide me with contextual information that I did not get elsewhere. In his article, Father O’Malley reflects on the notion of holiness and models of sanctity. In acknowledging Pius’s intellectual deficiencies, he states that sanctity is an affair of the heart, not the head. I am not so sure. Why would holiness infuse only the emotional life of the heart and not the whole person—the heart, the head and the body? Father O’Malley also discusses the pitfalls of examining historic figures who lived in a quite different cultural context from our own. When it comes to holiness, however, should not one of our guideposts be the quality of transcendence that we find in that person’s life—i.e., the capacity to see beyond the small-mindedness and limitations that characterize every period? I must confess that I will certainly not be looking to Pius IX as a model of holiness for my life. June 3, 1963, was a very sad day at La Salle High School in Arequipa, Peru. I saw older, conservative brothers with tears in their eyes as well as everybody else. I learned later that it was a very sad day everywhere, even in New York, where somebody ran through the streets crying, “Our pope is dead; what are we going to do?”. So why is it that when “our pope” was beatified, everybody was talking exclusively about Pius IX’s merits or faults? I could understand that happening in the secular press, but in America (8/26)? Isn’t Pope John much more relevant to us than Pope Pius IX? For several weeks I have been waiting for America’s celebration of Pope John. I’ll keep waiting. The article by John W. O’Malley, S.J., (8/26) presented a fairly accurate portrayal of what can be gleaned from the circumstances of Pius IX’s reign as pope. The negative as well as positive actions of Pius IX are understandable in light of a bygone era. But I do find a serious flaw in the statement about judging the standards of his day against our own, I do not think it is fair to judge the sanctity of any person based on the circumstances of his or her time nor our own. There is a standard that is timeless. The message of Jesus contained in the New Testament, I believe for Christians, is timeless. I do not believe we can use the societal standards of any given era as a norm for sanctity. If these two issues were acceptable, that would mean we could not judge the present society and individuals by their closeness to the Gospel norms but by their ties to the cultural norms of society. Anyone can demonstrate great external devotion but act contrary to the Gospel. The many monarchs and dictators who attended church regularly and had the friendship and support of high-ranking churchmen were responsible for the unjust deaths of hundreds of thousands. Carrying this a step further would mean much of modern day immorality does not matter as long as the person responsible has private devotion. Since this beatification seems politically motivated, maybe this shows the withdrawal of the Holy Spirit’s support for papal infallibility. This article also appeared in print, under the headline "The Beatification of Pope Pius IX," in the August 26, 2000 issue. John W. O’Malley, S.J., is professor of church history at the Weston Jesuit School of Theology in Cambridge, Mass. His most recent book, Trent and All That (Harvard University Press, 2000) is the Catholic Book Club selection for August.